We remind that grandmaster Anton Korobov took a pure first place with impressed result 8 from 9 points in passed tournament Czech Open 2009 in Pardubice. He kindly agreed to answer questions to GrossClub.com audience. Readers can leave comments or questions on forum branch, on most interesting of them Anton will further give answers. What attracted you most in chess? The process of cognition attracts the most, as well – no matter how trivial it is – an opportunity to earn money. At times I can marvel and beauty of ideas, but it is nowadays very rare. Like Mayakovsky wrote: “Sometimes a single word for shoveled tons of verbal ore. Well, the possibility – though occasionally, bask in the glory, too, can not mention! What do you think about chess game servers? Which do you prefer? It gets me an opportunity to get the adrenaline without leaving a house. For many years I play for the team PGMB in “Chess Planet” playing zone. Also I recently discovered the “PlayChess”. In general, I think that “overdose” of blitz on the internet leads to a degradation in real chess. What helps you tune to games? The psychological attitude to the party consists of a combination of listening to good music and calling me naughty words. Music helps to tune in to the gaming wave; other gives a much-needed element of anger and aggression. So Arm! What are the main differenced between chess professionals and amateurs? Grandmaster Anton Korobov at Czech Open. The difference mainly lies in the time that professional and amateur spends at chess. Another important factor – all the fans love chess, while among the pros there are many people hating it. It often happens in football that a good player after his career goes on coaching activities. Have you thought of this opportunity in your career? I never thought seriously about that, but it could be in future, I suppose. From personal experience I can say that the notion of “good player” is not synonymous with “good coach”. The coach must have set some specific skills required to be a good psychologist and educator, should be able to put pressure on the ward, and most importantly – do have a huge understanding of chess. In short, it is very rare nowadays. What are chess players should do primarily for the improvement? It is very individual process and you can not some generalizations. Perhaps the ideal model of study is a synthesis of pumping information and the development of certain general laws. That’s all that comes to mind on this topic. How many tournaments a year for you is the best? I would define a somewhere around six or seven per year. That gives an opportunity for full-fledged training and playing games. The perfect break between tournaments is around 6 weeks. This time is enough for rest, reflection of what happened and prepare for new games. Of course there are other opinions. Many GMs moved from one tournament to another without feeling any discomfort. The main drawback of this concept is that the loss of freshness and clarity of thought, without which it is impossible to play consistently and strongly. What are your impressions of the Czech Republic? Czech Republic – a great country, with very good beer. Of the things that really impress, I can mention a few dishes of national cuisine and a large number of strong players. Well, the level of ecology, of course, is very high. Would you like to stay here to live, like 10 years ago? But no one is offering! Life in the Czech Republic has the priority at least in terms of availability of the European passport, which does not require multiple visits to the embassy, standing in queues under the scorching sun or in terrible cold. Yes and conditions of the tournaments for players from Europe and other countries can not comparable. Moreover, state support for athletes in the Czech Republic at a higher level than in Ukraine, where athletes can only be proud of. You were at the famous club Danko. 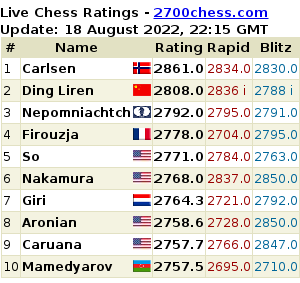 For that club also played such grandmasters as Ponomariov, Karjakin, Efimenko, Areshchenko and Kuzubov. What useful can be learned when dealing with these guys? The atmosphere of competition with such “Fantomases” attached wings. There were a lot of funny stories, but it is not for the format of the interview. We thank for interesting answers. We wish the further successes on international scene!